On the National List of Threatened Species, it appears in the “Vulnerable” category. In the 2004 edition of the Red Book of Spanish Birds (Libro Rojo de las Aves de España) it is listed as “Vulnerable”. Degradation of its habitat due to the development of cities and infrastructure, and accidents suffered during breeding season due to human interference or water pollution. 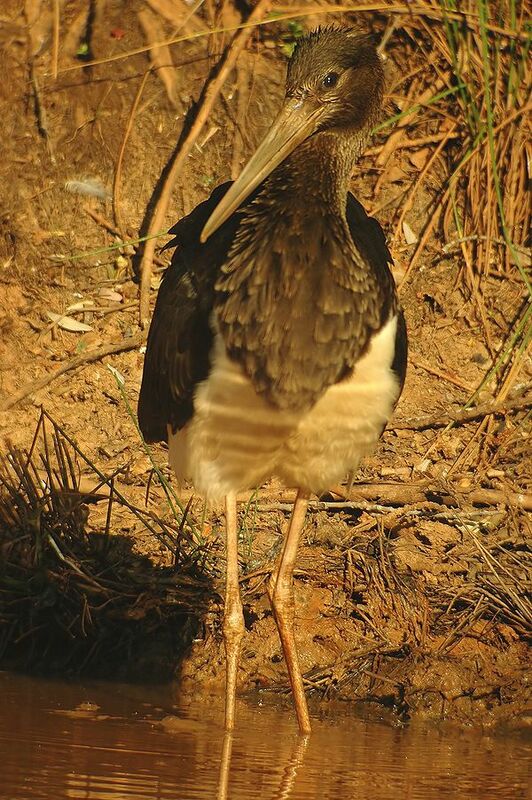 Identification: Large bird with black plumage and green streaks on its wings, neck and head that contrast with its white breast. In adults the legs, bill and around the eyes is red. In flight its head and legs are outstretched. 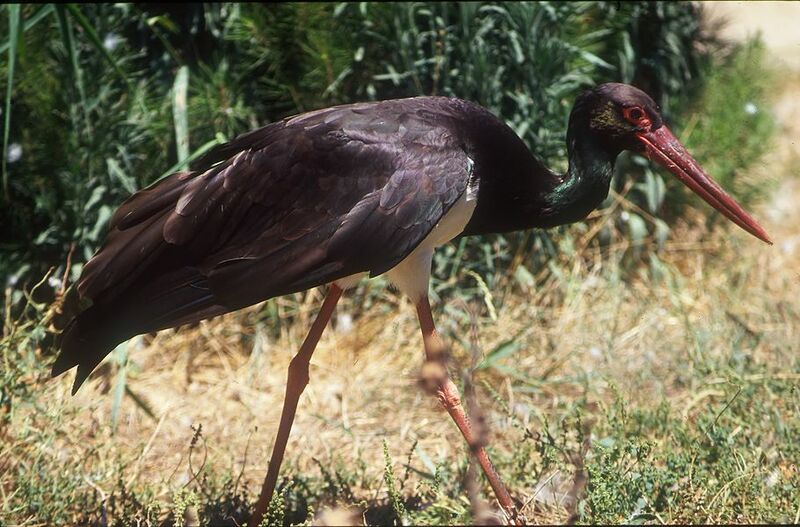 Song: It is barely audible, and unlike the white stork, its bill clappering is very weak. It makes a type of whistling sound, "shee loo-shee loo". Diet: It mostly feeds on fish and complements its diet with amphibians and insects. Reproduction: They build large nests made of branches and reinforced by earth and grass, which they usually place above rocks and can be reused. The chicks are cared for by both adults, and one parent is always in the nest during the first few days. Parents feed the chicks by regurgitating them their food, first inside the mouth and later in the nest. It occupies wooded areas, river chasms and rocky mountainous areas that are near wet areas. 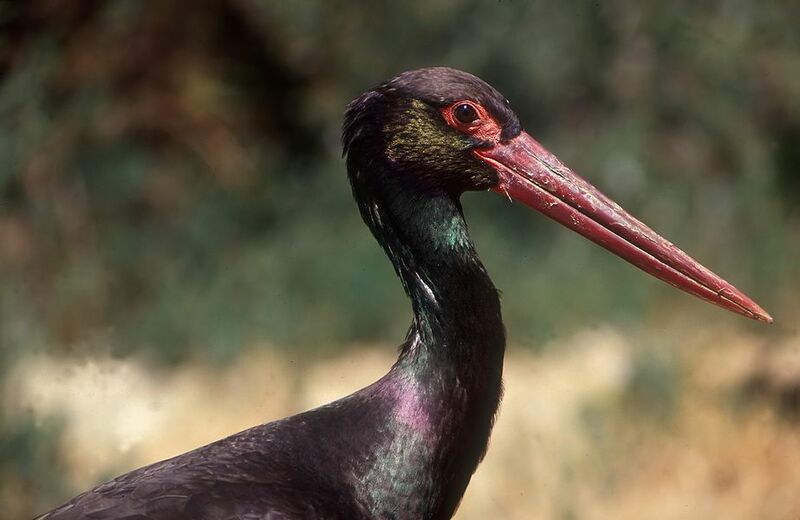 In Spain: During breeding season it is distributed throughout the southwestern quadrant of the peninsula; it migrates through the eastern half; in winter it is located in Doñana, some areas of Extremadura, and in the Tiétar River valley (Ávila, Toledo-Cáceres). In Castile and León: It is distributed throughout the southern region of the community, breeding regularly in Salamanca, Ávila, Segovia and Zamora. Movements and migrations: Although they are migratory, it has been observed that there are populations that do not go to Africa and that remain during winter. In Spain: There is an estimated population of no more than 400 breeding pairs. In Castile and León: There is an estimated population of 73 breeding pairs.